Why to book a holiday in Builth Wells! We cover a vast and enormously diverse area right from the English border to the west of the Brecon Beacons National Park, from the Welsh Valleys as far north as Llandrindod Wells. We know that everyone knows about the majestic mountains, but we plan to expose some of the lesser known pearls of the area. This month, we're spilling the beans on Builth Wells. The most famous reason is probably that it's the home of the Royal Welsh Show – the biggest of its kind in Europe. 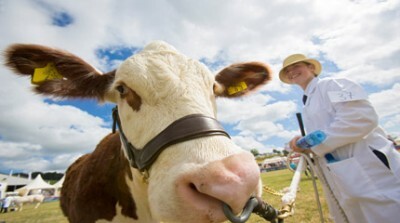 Aside from the show itself, there are loads of events throughout the year, including regular cob sales, bee keeping conventions, dog shows, antiques fairs and the winter show. The town itself is a gem. It's an old spa town set on the river Wye which is home to the brilliant Wyeside Arts Centre. It has a great programme of events including cinema screenings, workshops, plays, dance – it's well worth a look. It's fantastic for walking. The Wye Valley Walk, a 136-mile stretch of stunning walking trails, passes right through Builth Wells and offers a route of startling contrasts, from ravine gorges, woodland and meadows to rugged and remote uplands. The nearby Elan Valley is referred to by those in the know as the 'Welsh lake District', We have some great holiday cottages for you to base yourself in for your trip, here's just a handful: If you're looking for a romantic getaway, you could try Lily Pond Lodge, Park Wells Cottage (with its own hot tub) or Bach Cottage, Larger groups need look no further than the 5* Rhos Ferrig House, a spacious stone farmhouse with ten acres of woodland, or Woodridge Barn, a spacious eco barn in the Wye Valley with its own home cinema. For those interested in doing a little fishing, Wyeside Barn and Gromain Lodge are very close to the river Wye – Gromain was the old fishing lodge for the Chichester Estate. For more information, have a look at www.breconcottages.com or call the team on 01874676446.